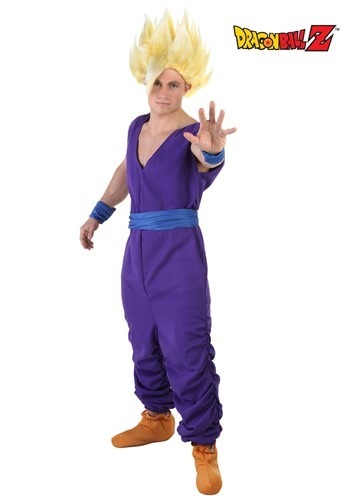 Adult Gohan Costume By: Fun Costumes for the 2015 Costume season. Training in the Hyperbolic Time Chamber is a lot tougher than it sounds. First of all, unless you're a personal friend of Kami, he won't let you use it. Second, that place has some messed up gravity issues, so unless you're already packing some major muscles, you might not make it to long. Third, it's always bright in there, so getting good sleep is out of the question. You're much better off wearing this Gohan outfit if you want to get your Super Saiyan powers flowing. It's fully licensed from the Dragon Ball Z series!